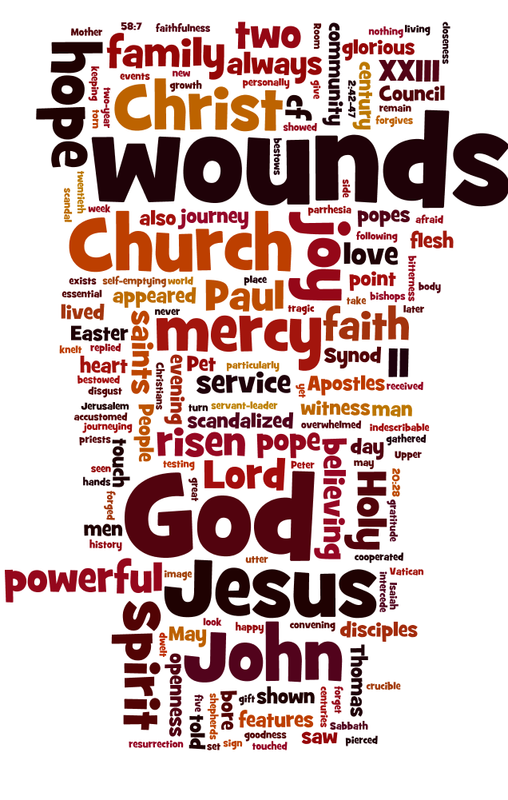 Several years ago, after my parents' deaths, I found myself reflecting at Easter on Jesus' glorious wounds. Some of the fruits of this reflection appeared in my Easter blogpost from two years ago (here), and came back to me last week on Easter Sunday when we were reflecting and sharing in community. Then, a few days ago when I met my spiritual director, she also made some reference to these wounds... and now, today, they are central to the homily delivered by Pope Francis at the canonisation of John XXIII and John Paul II (here). Pope Francis takes this reflection to another depth, when he says The wounds of Jesus are a scandal, a stumbling block for faith, yet they are also the test of faith. That is why on the body of the risen Christ the wounds never pass away: they remain, for those wounds are the enduring sign of God’s love for us. They are essential for believing in God. Not for believing that God exists, but for believing that God is love, mercy and faithfulness. Saint Peter, quoting Isaiah, writes to Christians: “by his wounds you have been healed” (1 Pet 2:24, cf. Is 53:5). Wounds which are signs not only of redemption and healing, but of God's infinite love... And - significantly - that quote from Isaiah is very dear to me, as it was the devise (motto) given to my group just before we made our final profession of vows. So now I hear by his wounds, by the enduring sign of his love you have been healed... And as I reflect on this homily, I experience a very real sense of being drawn deeper and deeper into this mystery, centred on love, in which there is a wholeness and a call waiting to be explored at more depth.